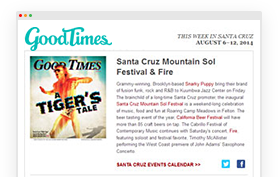 SantaCruz.com is the best way to find great local businesses! BSB has a constantly changing inventory of quality properties for lease or sale to suit any business need. View available land, office and warehouse space now. Seymour Marine Discovery Center at the Long Marine Laboratory is a world-class experience for all visitors to the Santa Cruz and Monterey area. As part of the Boardwalk Bowl, Coasters Bar & Grill is the premium spot in Santa Cruz for karaoke, live music, delicious food, good drinks, and great people. A most unique hotel experience that explores an urban forest set inside a beach town. The boutique Hotel Paradox prides itself on genuine hospitality, and a design-forward experience delighting the senses. Severino's Bar & Grill offers fresh California cuisine in a warm, friendly atmosphere with fabulous views of the Koi pond and cascading waterfall. Enjoy Happy Hour every day of the week and live entertainment on select evenings. Minutes from beautiful beaches, relaxing accommodations, attentive service, and memories that last forever! Seascape Beach Resort sets the pace for the ultimate in comfort with all of the luxury of a four-diamond resort. A Pleasure Point Tradition. Enjoy our delicious take on California comfort food, prime cuts, chops and cocktails. Mount Hermon Adventures is home to the world-famous Redwood Canopy Tours zip line tour, Sequoia Aerial Adventure course, Team Building programs and more! The classic club in Santa Cruz. The Catalyst is where you will find the hottest artists for all types of music, local and national. Stagnaro Bros. features a menu with more than 20 different types of fresh seafood every day, as well as pasta dishes, steaks and a children's menu. Learn about California's own rain forest, the coastal redwoods, during this train ride through the woods.